In the month of July India added 1.52 million new subscribers taking the total tally to 874.88 million. This is the 3rd consecutive month where the mobile subscriber growth has registered a rise. In last 1 year before July 2013, 9 out of 12 months have seen fall in number of subscribers. The total subscribers numbers in July 2013 are much lower than what we had in July 2013. It is interesting to note that though total mobile subscriber numbers have increased, the active subscriber has fallen marginally for the first time. In month of June 2013 there were 731.47 active connections as compared to 731.40 in July 2013. – With an increase of 1.52 million in July 2013, total mobile subscriber base has increased to 874.88 million. 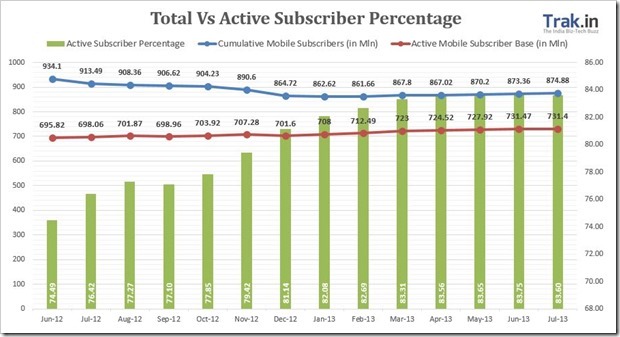 India had 873.36 million subscribers by end of June 2013. – Urban India witnessed an increase of 0.67 percent or 3.52 mln subscribers, while rural mobile subscriber base decreased by 0.57 percent or 2.00 mln. – Urban Teledensity increased to 139.87 from 139.16 in June, while the rural tele-density decreased to 40.88 from previous 41.14. – Urban mobile subscriber share stands at 60.10% as compared 39.90% of rural subscribers. – 2.23 million new Mobile portability requests were made in month of July 2013, taking the total tally of MNP requests since launch to 97.82 mln. – Active Mobile Subscriber base decreased from 731.47 mln in June 2013 to 731.40 mln in July 2013 taking the active percentage to 83.60 percent. – Broadband Subscription increased to 15.24 mln from previous tally of 15.19 mln. – Wireline Subscriber base fell to 29.58 mln in July 2013 as compared to previously 29.73 million. – India’s total telecom subscriber base (wireless+wireline) has increased to 904.46 mln in July 2013, compared to 903.09 mln in June 2013. 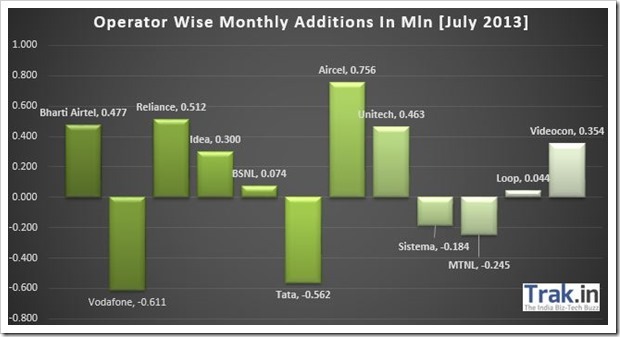 In month of July Aircel added maximum number of subscribers (0.756 mln) followed by Reliance (0.512 mln) and Bharti Airtel (0.477 mln), while Vodafone probably for the was the biggest loser with loss of over 0.611 mln subscribers. Tata’s losing streak continued with a loss over over half million subscribers in month of July 2013. 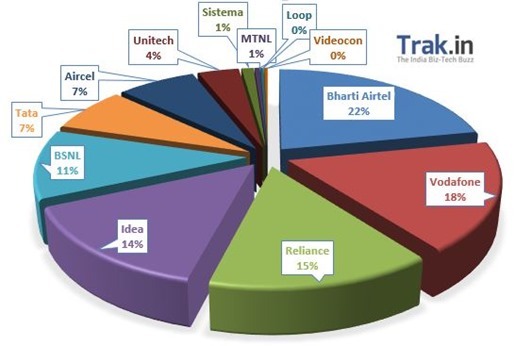 Bharti Airtel remains the top telecom operator in India with 21.88 percent market share followed by Vodafone (17.65%) and Reliance (14.43%). Idea is now inching close to become 3rd largest mobile operator in India with 14.32 percent.